Events are planned activities you conduct. A webinar, for example. While events are conducted by users, their schedule is effectively communicated to fellow participants using the Calendar. These events could be for students of a particular course or group, or for individual users. In Moodle, a closing date for assignments or certain activities are also saved as events in the calendar. Creating an event in Moodle is quite simple; simpler than creating a course or adding an activity. Since the event will be displayed on the calendar, the traditional approach is to head over to the expanded calendar view. Clicking on the month-name should open the expanded month view. To create an event, you need to click on ‘New Event’ button. 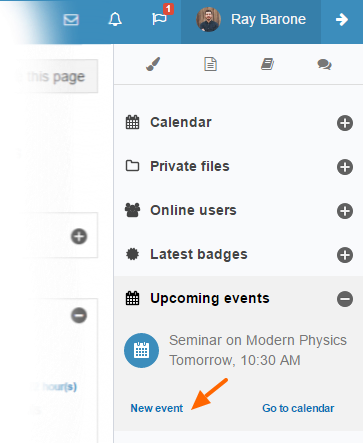 If you’re using Edwiser RemUI another option you have, is to hover over a specific date, and click on the ‘Add new Event’ icon. All that’s left now, is to add event details and save it. Moodle offers 4 types of events that you can create. These types are based on event access capabilities. For each of the events, you can set the event title, description, start date, event duration (if applicable in minutes, or until a particular date), and create recurring events using the ‘Repeated events‘ options. Remember to click on ‘Save changes’ to create the event. With the ‘Upcoming events‘ widget that Edwiser RemUI provides, event creation is simplified. You now have a shortcut to add a new event! The different types of events are clearly highlighted in Moodle and are color-coded in Edwiser RemUI. You have the option to filter events view, to hide or show events in the calendar. Well, that’s all for now. Watch this space for more such Moodle tips.